This is one of those appetizers that just works. In one little bite you get sweet, sour, pungent, smokey, salty, crispy and smooth. It looks amazing, it’s easy to make and is perfect for this time of year. As far as appetizers go, I look for the ‘incredible bite’. Something balanced, incredibly flavored, and really wets your appetite. Forget about the pigs in a blanket, bacon wrapped scallops, mini-wellingtons, or other ‘traditional’ appetizers still kicking around from the 1980s. Think natural flavors, think balance, think about great flavors in your favorite dish compacted into single bits. You like chicken marsala? Find a way to make it into one single bite! (which is easy). You like Bbq chicken? Make it into a single bite, bursting with flavor. Pre-made frozen appetizers are good in a pinch, but it’s my job to force you to think about food in a different way. This is a great example of one of my favorite salads compacted into a single bite. Of course it’s not ‘mine’ per se, but it illustrates the point I am trying to make very well, and gives you another incredibly delicious and easy recipe to try. Mission figs are a late summer treat. They’re sweet and have just enough natural acid to keep you from a total sugar coma. Smoked bacon… what else can you say? Gorgonzola cheese… one of the milder bleu vein cheeses and one of the few I can tolerate eating. Balsamic glaze. Put all these ingredients and you have dynamite on a plate. Dynamite in a bite size package! Dynamite like a flavor explosion! Mix the balsamic and sugar together and reduce, in a heavy bottom non-reactive sauce pot, until thick enough to coat the back of a spoon. Cool and reserve. 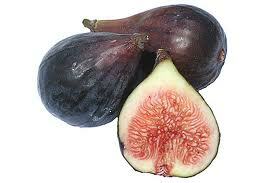 Using your thump or the back of a small spoon, make a small indent in the center of each fig half. Force a little bit of cheese into the indent. Wrap the entire thing as tight as possible with bacon. No need for a tooth pick; the bacon should stick to itself. On an oiled parchment lined baking pan, arrange the figs with the ‘loose’ bacon side down. Roast for about 20 mins, or until the bacon is crispy. Let cool to room temp. Arrange on a platter, drizzle a little of the balsamic reduction over the top and serve. I like to serve this on a small bed of greens just for height and color contrast on the plate. A little chiffonade of basil will also go a long way!